Every three years a major international conference on bats draws the leading workers in the field to a carefully orchestrated presentation of the research and advances and current state of understanding of bat biology. Bats are the second most populous group of mammalia species, after rodents, and they are probably the most intensively studied group of mammals. Virtually all mammologists and a large proportion of organismic biologists are interested in bats. 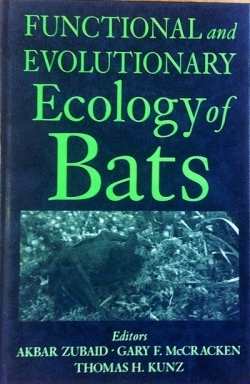 The earlier two edited books deriving from previous bat research conferences, as well as this one, have been rigorously edited by Tom Kunz and others, with all chapters subjected to peer review. The resulting volumes, published first by Academic Press and most recently by Smithsonian, have sold widely as the definitive synthetic treatments of current scientific understanding of bats. Reviews "With 39 invited contributors, this text presents a wealth of detailed information about the interaction of bats and their environment. This is an invaluable reference work for bat biologists that calls attention to some of the modern technological breakthroughs being made in the study of bats." --Journal of Cave and Karst Studies 360 pages; 87 halftones & line illus. ; Hardcover. Edited by Akbar Zubaid, Professor of Biological Sciences, Universiti Kebangsaan, Malaysia, Gary F. McCracken, Professor of Ecology and Evolutionary Biology, University of Tennessee, and Thomas Kunz, Professor of Biology, Boston University, United States.